Editor's Note: If you're new to this series, make sure to go back and check out History of the Drum Set Part I: The Evolution of the Tom and Part III: The Shape–Shifting Bass Drum. Welcome to Part II in our complete history of the drum set series. Today we're honing in on the all-important snare drum, often viewed as the very center of the set. In Western music, the snare drum is the “lead” voice of the drum kit. For pop, rock, funk, and hip-hop, it provides a backbeat that cuts through the wall of vocal and instrumental sound to anchor the rhythm of the tune. In jazz and westernized Latin music, it is often used for “comping” — a lyrical, conversational, and improvisatory role that plays call-and-response rhythms with the lead instrument or voice. These leading roles are befitting of the snare drum’s storied history as it evolved from the medieval “tabor” drum (with its distinctive gut-wire rattle) to the military “side drum,” which was slung over the shoulder of a drummer who could amplify company leaders’ commands and provide a marching rhythm for ranks of soldiers through dry, rudimental patterns. Although these early developments are fascinating and certainly merit discussion, we’re mainly concerned with how the snare evolved as it became an essential part of the modern drummer’s setup. Without it, the drum kit as we know it simply wouldn’t exist. In the late 1800s, it was common for players to “double drum," playing both the snare and bass drum with sticks, which can be rightfully seen as the first concrete step in the evolution of the drum kit. The snares used at this time were relatively simple, featuring reinforced steam-bent single-ply shells (usually mahogany or walnut) with single tension lugs, T-rods, and wooden hoops. Only one of the drumheads had tension adjustment and the strainers did not have quick engage/disengage levers. A notable exception to this was an early metal-shelled drum owned by John Philip Sousa Band’s Tom Mills. 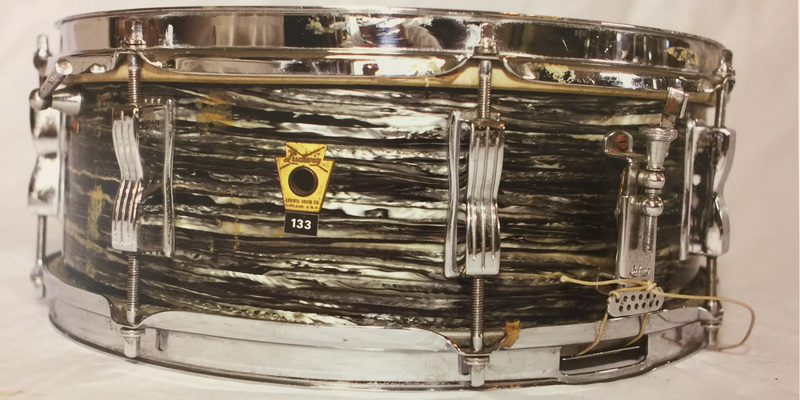 Manufactured by Sonor, the drum featured a 6.5x13” welded brass shell, metal hoops, and separate tension lugs. The robust timbre and revolutionary design of this drum caught the eye of a young Leedy sales agent by the name of William F. Ludwig. 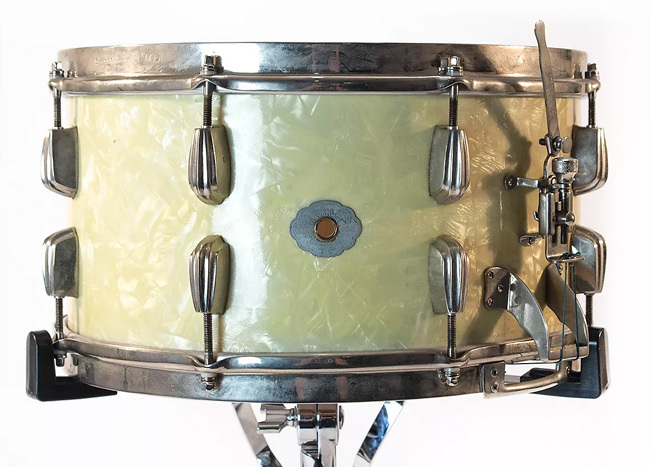 After months of pestering Mills, Ludwig purchased the drum and brought it directly to his boss, Ulysses G. Leedy, who promptly refused Ludwig’s request to research and develop a similar model as he believed metal was an unsuitable drum shell material. Ludwig began to develop a copy of the drum on his own, convinced that its superior construction and tone would be the key to standing out in the highly competitive drum market. Before long, their innovations would become industry standards, as competitors looked for ways to attain the high level of performance and reliability of Ludwig & Ludwig snare drums." William and his brother Theo would go on to find great success with their newly-developed line of metal-shelled snares. Along with other technical advancements, such as the bass drum pedal and pedal-tuned timpani, the brothers developed a new “tube lug” design, joining the top and bottom single-tension lugs to reduce strain on the shell. Before long, their innovations would become industry standards, as competitors looked for ways to attain the high level of performance and reliability of Ludwig & Ludwig snare drums. As drum technology continued to evolve through the ‘20s and ‘30s, two titans of the snare world were born that would have a lasting impact on drum design: the Ludwig DeLuxe “Black Beauty” and Slingerland Radio King. Expanding on the popular all-metal brass snare drum models, Ludwig introduced the DeLuxe line around 1926. Available in a variety of depths and 14- or 15-inch diameters, the drum was a true masterpiece, featuring hand-engraved ornamentation, a variety of colored enamel choices, and even a gold-plated option dubbed the Triumphal model. The gun-metal black version of this drum ultimately proved to be the most popular and before long, Leedy and Slingerland followed with their own takes on the design called the Black Elite and Black Beauty respectively. Although Slingerland was the first to use the term “Black Beauty” in its literature, the name would become synonymous with Ludwig’s original DeLuxe model, in part due to the highly sought-after reissues released by Ludwig starting in the 1970s. Despite the proliferation of metal-shelled drums, wooden models still retained immense popularity within big band and orchestral circles. In 1935, Slingerland released a new solid maple shell snare called the Broadcaster. After some pressure from competitor Gretsch, who already had a well-established “Broadkaster” drum line, Slingerland changed the name of their drums to Radio King. With its sleek, streamlined lug casings, hefty adjustable snare system, and eye-catching pearloid or sparkle wraps, the drum was a true work of art. Most famously used by Gene Krupa, the Radio King would become a staple of Slingerland’s lineup, its single-ply shell providing a warm, boxy sound and superior sensitivity that captivated drummers for decades to come, from Jimmy Chamberlin and Neil Peart to Buddy Rich. In 1941, Ludwig introduced its “Super Ludwig” line of snares, boasting the latest and greatest in drumming tech. 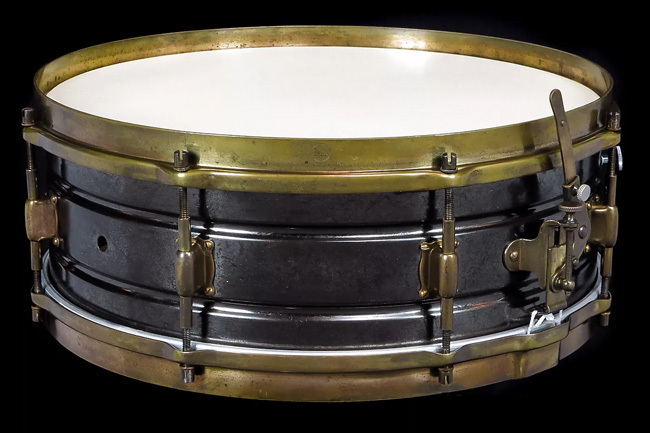 Built around a reinforced mahogany or nickel-plated brass shell, the drum came in a 14-inch size, with a variety of depths available. The parallel snare system ensured even tension and each individual snare wire had an additional fine-tuning adjustment. Self-aligning art deco-esque “Imperial” tension lugs ensured there was no danger of stripping the threads if the heads were not seated dead-center and an internal tone control allowed the player to dial in the desired amount of dampening for any musical situation. Ludwig reintroduced the Super Ludwig as a metal shell-only model in 1960, with a sleek new design. The Imperial lugs returned, sitting atop a beaded two-piece brass shell. Chrome-plated or clear-lacquer finishes were available, the former proving more popular but the latter allowing the rich lustre of the brass show through. The drum was available in 5x14-inch or 6.5x14-inch sizes, with the shallower version selling in far greater numbers. Deeper models, especially those with clear-lacquer shells, are exceedingly rare today. 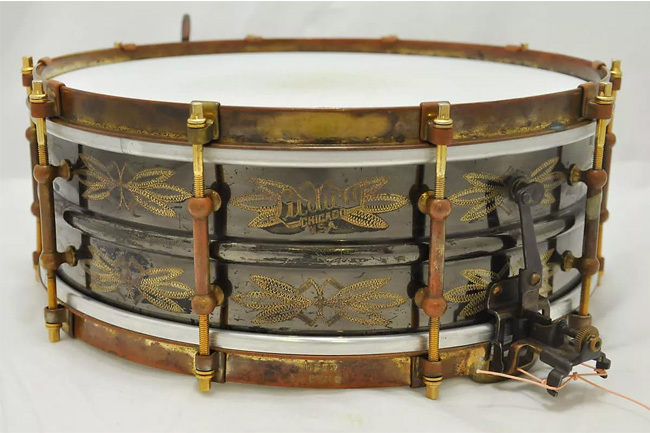 The high cost of brass would cause Ludwig to rethink the design of the drum and around 1963, production switched to seamless spun aluminum shells. Two strainer designs were now offered: The standard P-83 equipped model was dubbed “Supraphonic”, while the drum sporting the parallel snare system was called “Super Sensitive”. The dry, bright snap of these drums would prove an almost instant hit. Legends such as Mitch Mitchell, John Bonham, Hal Blaine, and countless others used the Supraphonic almost exclusively and before long, most outfits in the Ludwig catalog came equipped with the 5x14” LM400 model as standard. 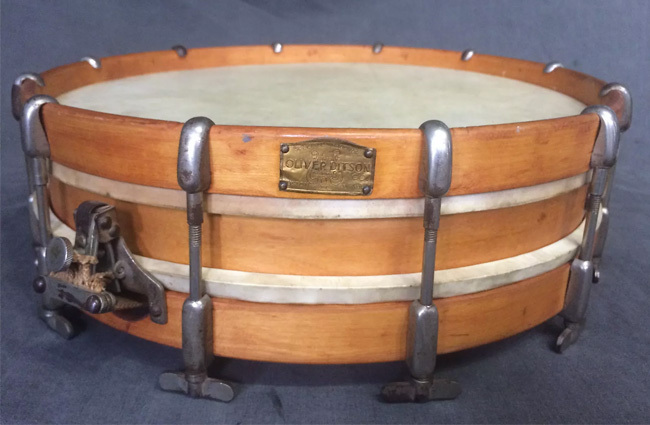 Eventually, the “Supra” would come to be called the most recorded snare drum in history, and it remains a favorite for many professional players and hobbyists alike. Ludwig still produces the drum to this day and despite some additional options and hardware upgrades, its construction is essentially unchanged. 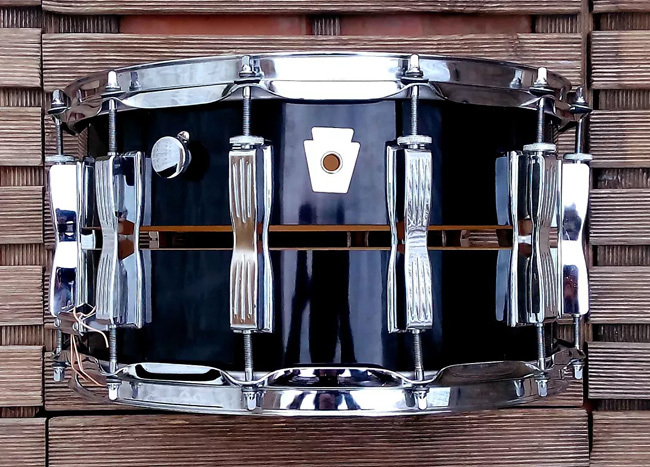 As if Ludwig didn’t have enough of a claim to snare drum fame already, they reintroduced the legendary Black Beauty snare drum in 1976 with some modern improvements. Gone were the solid tube lugs, welded two-piece shells, and clip-style rims. Instead, the drum was modeled after the art deco look of the Supra, with ten Imperial lugs sitting atop a seamless beaded shell. Brass was still the material of choice, as was the obligatory black-nickel plating. Available in Ludwig’s standard 5x14” and 6.5x14” sizes, the drums could be had with either the usual P-85 Supraphonic snare strainer or the more expensive Super-Sensitive model. These drums would go on to become favorites of many top session players — even those who publicly endorsed other brands — and today, an original late-70s Black Beauty can command prices in the $1000-$2000 range, with the limited edition hand-engraved models going for even more. 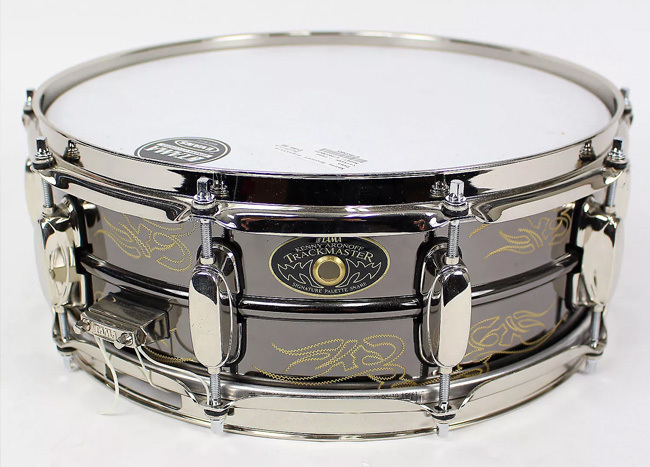 Today, nearly every major drum company produces some variety of Black Nickel-Plated Brass snare, from DW’s Collector’s Series to Tama’s Trackmaster and Pearl’s Sensitone. 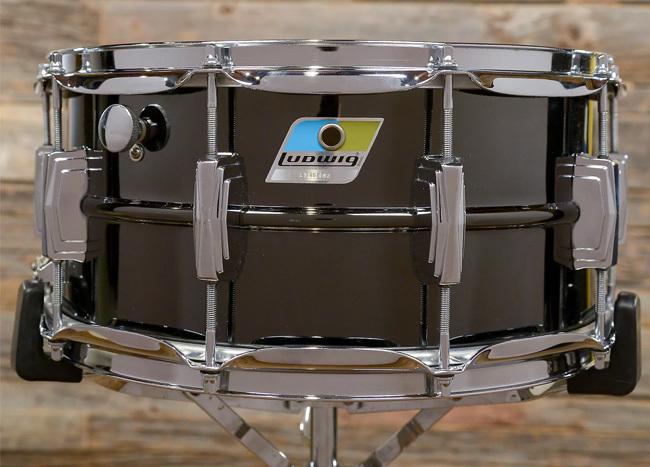 Ludwig still offers the reissued Black Beauty, now available with additional options like tube lugs, hammered shells, and die cast hoops, and it is still a perennial favorite that can be found on stages and in studios the world over. 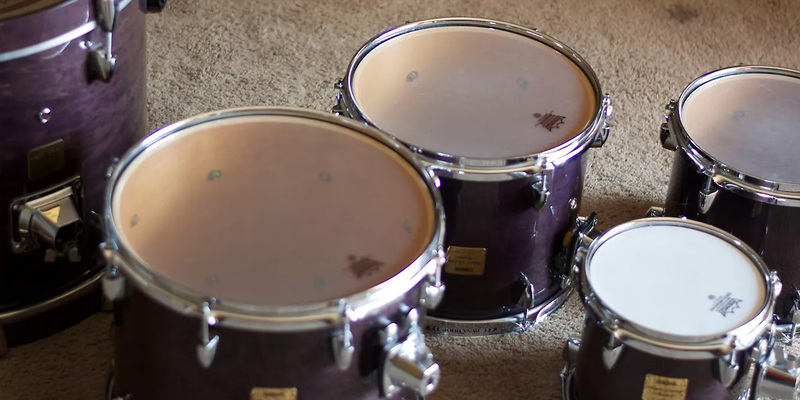 By the ‘60s and ‘70s, snare drum sizes had become relatively standardized, with most companies offering 5x14-inch and 6.5x14-inch versions of their popular models. Some shallower “piccolo” drums (like the Ludwig Downbeat) and larger orchestral models (such as the Leedy Broadway) were offered as well. However, the snare drum, like the rest of the kit, did not escape the “power” craze of the 1980s and would soon grow heftier as smaller drums went out of style. Shells got thicker and many drums were outfitted with additional lugs and beefier hardware. Perhaps the most memorable approaches to this new philosophy were the Ludwig Coliseum and Sonor HLD-590. Both 8x14-inch in size, they each sported no less than twelve tension rods per head. The Coliseum bore Ludwig’s now-standard 6-ply Maple shell and was available in a “slotted” configuration, which left nearly an inch gap in the middle of the drum shell for a shotgun-like attack. Meanwhile, in true Sonor fashion, the HLD-590 was an over-engineered masterpiece, with its hefty 30 pound sand-cast bronze shell decked out in chunky copper-plated hardware, complete with die-cast hoops and an unbelievably complicated (but beautifully designed) parallel snare system. Needless to say, the main instigators of this trend were the rock and metal drummers of the time, like Twisted Sister’s A.J. Pero (who used a bona-fide 12x14-inch Ludwig marching snare) and Motley Crue’s Tommy Lee. In many fusion and pop circles, by contrast, standard-sized drums remained the weapon of choice. Steve Gadd used his 5x14-inch Ludwig Supraphonic on most sessions, Bill Bruford played a 6.5x14-inch Ludwig Super-Sensitive or Tama Mastercraft steel snare, and Neil Peart had his trusty 5x14-inch solid-shell Slingerland. Eventually, the oversized snare trend would fade as drummers continued to gravitate towards the more expressive, studio-friendly nature of shallower models. 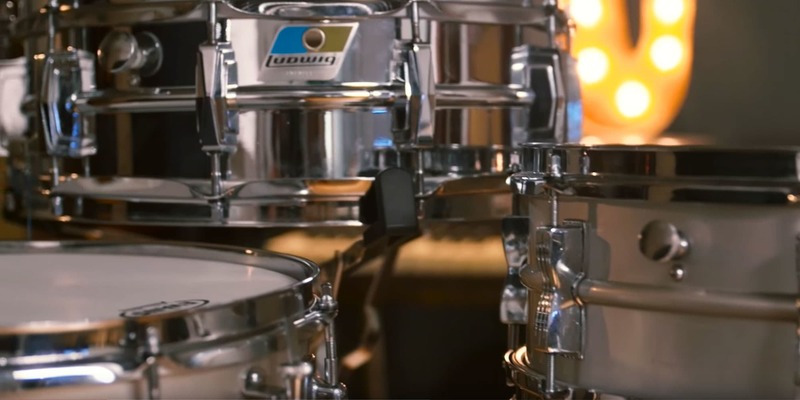 We took three prime examples from Ludwig’s classic 1970s era and put them head-to-head so you can decide which one is right for your sound and budget. While the venerable Supraphonics, Black Beauties, and Radio Kings continued to reign supreme in many studio rigs, Japanese manufacturer Tama was working on a design that would go on to become a recording legend in its own right. Through their Mastercraft series (an array of high-end snare drums with various shell materials and hardware appointments) the company introduced a new metal-shelled model around 1980. One of the first commercially available sand-cast drums, this hefty beast was marketed as the “Bell Brass” drum even though in reality, its shell was composed of bronze. Its deafening rimshot, unparalleled sensitivity and musical yet controlled overtones, made it a natural favorite of many rock and pop engineers. 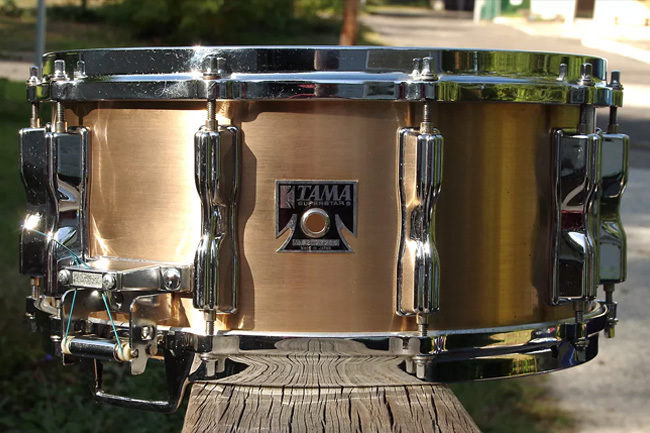 The 6.5x14-inch Mastercraft Bell Brass was truly in a class of its own, especially when paired with Tama’s monstrous cast bronze hoops The drum is now regarded as something of the Black Beauty of its time, appearing on countless era-defining records in the 1990s and 2000s — from Metallica and System of a Down to Nirvana and Audioslave. Though Tama reissued the original iteration of the drum in 2014, the original models continue to command high prices and remain a true “holy grail” for many drum collectors. 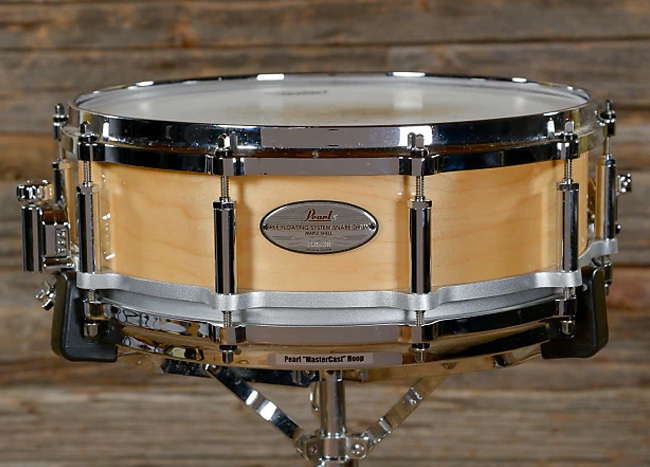 Although shell material, hardware specifications, and sizes continuously evolved during the middle part of the 20th century, the basic elements of the snare drum remained relatively static: tension lugs and snare strainers bolted directly to the shell. The first real quantum leap in snare design came from CB Percussion, an importer of entry-level kits and snares into the U.S. In the late 1970s, CB developed a method for outfitting snare hardware without penetrating the drum shell itself, increasing sustain and resonance. Released under the CB700 series, these “Free Floating” drums were available in a variety of sizes with steel, brass, or maple shells. The lugs and strainer were attached to an aluminum ring that served as the resonant bearing edge and provided a base on which the drum shell proper would sit. Pearl — which was involved in the manufacturing and distribution of some of CB’s products — quickly took a liking to this design and licensed it for their own use. After debuting their updated version the early ‘80s, they would go on to expand the offerings to include aluminum and bronze shells, along with additional sizes like the shallow 3.5x14” piccolo snare (famously used by Toto drummer and studio legend, Jeff Porcaro). These affordable drums offered a flexibility and highly resonant tonal quality that would prove to be wildly popular with rock and metal drummers. Pearl is still making select models today, expanding their shell offerings to include mahogany and acrylic. There is a duality in the nature of the modern snare drum, perhaps indicative of a musical landscape that seems to be of two minds. On the one hand, retro has never been hotter, as popular music continues to retread and expand upon territory first explored in the folk and rock movements of the ‘50s and ‘60s. Meanwhile, genre barriers are collapsing as musicians find new ways to collaborate with each other without respecting the boundaries of old. For the 21st century drummer, the snare is the ultimate expression of this individuality, which is reflective of the staggering array of options available from tube lugs to offset, 5x10-inch to 8x15-inch, and acrylic to zelkova wood. And yet, for all its variety, the snare has not forgotten its past, and homages to the classics can be found in product lineups from nearly every manufacturer. From the Radio King-esque solid shell offerings of Craviotto and Dunnet, to the split-shell Coliseum reissues from Ludwig and tube lug-adorned beaded shell drums from Joyful Noise (recalling the ornately designed drums of the 1920s and ‘30s), the snare drum is an instrument both on the cutting edge of musical evolution and positively steeped in its own history. In this series, we're examining the history of each piece of the modern drum kit. First stop: the tom–toms.